Maintaining healthy gums is an important component of oral health and the foundation of a beautiful smile. No matter if you are seeking to address gum disease or eliminate excessive gum tissue to enhance the appearance of your smile, Dr. Bruno Lemay can achieve your goals with a complete range of periodontal care treatments at his Palm Springs, CA-area dental practice. To learn more about how you can benefit from a periodontal treatment, contact Desert Dental Alternatives today. Studies show that nearly eight out of 10 adults in the United States have some form of gum disease. In its early stages, gum disease (or gingivitis) can cause periodontal tissues to swell, bleed, or become tender. When left untreated, it can progress into periodontitis, a more advanced infection in which gum tissue begins to pull away from teeth, creating pockets of bacteria. Periodontitis may even lead to tooth loss since oral bacteria can damage the jawbone, teeth, and other oral structures. 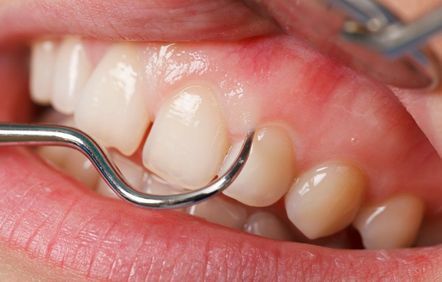 To treat mild to moderate gum disease, we can perform scaling and root planing, which is also known as a deep cleaning. During this procedure, we will eliminate plaque that has accumulated both above and below the gum line before smoothing the rough spots on dental roots. We often recommend using Arrestin® in conjunction with a scaling and root planing procedure to help eliminate bacteria beneath your gum line. The Arrestin® formula contains microspheres that release a special antibiotic over time. To treat the early stages of gum disease — or to help prevent a periodontal infection from returning after treatment — we may recommend Perio Protect®. With the Perio Protect® system, we will provide you with a customized plastic tray, which you will fill with a special antibacterial chemical solution and wear for a few minutes each day. Not only can this treatment eliminate gum disease-causing bacteria and dissolve plaque, it can even whiten your teeth in the process. As gum disease progresses, periodontal tissue will begin to pull away from teeth, creating pockets that can make you prone to further infection. During a pocket irrigation procedure, we will use special tools to rinse out bacteria and debris that have collected in these pockets. We may combine pocket reduction with Arrestin® or Perio Protect® for enhanced results. Over time, periodontal pockets can become too deep to address with a deep cleaning or antibacterial treatment. In these cases, Dr. Lemay can perform pocket reduction, during which he will fold back gum tissue and remove bacteria before securing the tissue back into place. In addition to having a major impact on your oral and overall health, your gums also provide a frame your smile. Having a disproportionate or uneven gum line can distort the appearance of your teeth or make you feel self-conscious about your smile. As a lasting and minimally invasive solution, Dr. Lemay can use our advanced YAG laser to precisely reshape your gums for a more attractive look. If you are missing one or more teeth, dental implants offer the best way to help restore the strength and function of your smile. Implants are small titanium posts inserted into your jawbone, where they fuse with the surrounding bone to secure beautiful, sturdy restorations with a comfortable fit and natural look. To qualify for dental implants, you will need to have healthy teeth and gums. Dr. Lemay can provide periodontal treatment to help you become eligible for this procedure. Dr. Lemay and our team can help you with virtually every aspect of your periodontal health. Contact us today to schedule a consultation and learn more.